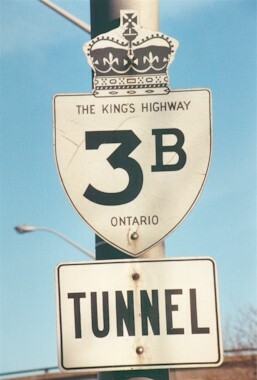 King's Highway 3B was created in 1935, after Highway 3A leading into Windsor was renumbered as Highway 3B. The highway followed Dougall Avenue from Highway 3 (Talbot Road) in South Sandwich Township into the City of Windsor. In 1940, Highway 3B was rerouted north of Tecumseh Road. Instead of following Dougall Avenue into Downtown Windsor, Highway 3B was rerouted onto Ouellette Avenue north of Tecumseh Road. In 1962, Ouellette Avenue was realigned south of Tecumseh Road, to eliminate the jog in the highway between Dougall Avenue and Ouellette Avenue. In 1966, Highway 3B was officially designated as a connecting link by the Department of Highways. The southern portion of Highway 3B from the Highway 401 (Tunnel Route) Interchange at Howard Avenue to the Highway 3 Junction was decommissioned in 1975. The rest of Highway 3B from the Howard Avenue Interchange to Downtown Windsor remained as an official signed route until March 31, 1997, when the connecting link status of Highway 3B was repealed. The former route of Highway 3B is now known as Ouellette Avenue and Dougall Avenue. Over the years, two other routes have been designated as Highway 3B in Ontario. The other two Highway 3B routes were located in Maidstone and Tillsonburg, but these highways were not related in any way to Windsor's Highway 3B.